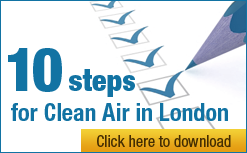 “The Campaign for Clean Air in London is delighted to have received the Mayor’s full support for its goals to improve air quality for all and to find that he believes that all Londoners have the right to clean and healthy air. The Campaign has one overarching aim which is to achieve urgently World Health Organisation (WHO) recommended standards of air quality throughout London. “The Campaign joins the Mayor in calling on the UK Government to take action to support London’s efforts to improve air quality. Furthermore, the Campaign for Clean Air in London asks again the Prime Minister and David Miliband, the Secretary of State for the Department of the Environment Food and Rural Affairs, to reply to letters to them dated 23 December and 5 January respectively, which invited them also to pledge their support for the Campaign for Clean Air in London. It is not as if serious air pollution can even be dismissed as a “London problem”. In 2006, Bradford, Glasgow and Scunthorpe joined London in breaching European Union legal limits on air quality and Port Talbot’s air pollution hit the maximum recommended level. where this Campaign Update has been published today. A recent listing of our supporters appears there. The full text of the Mayor’s letter appears below. Contact Simon through the Campaign homepage on the BBC Action Network web link above. Thank you for your letter of 5 January regarding improving London’s air quality. I am fully supportive of your goals to improve air quality for all and encourage others to play their part. I believe that all Londoners have the right to clean and healthy air and I am working hard to address this. London’s air quality has improved considerably over the last decade. Levels of NOx and PM10 – the primary pollutants of concern – are falling. The problem is that they are not falling fast enough, which is why I am about to make London a Low Emission Zone (LEZ). I am aware that the legislative framework at the EU and UK level is being revised and it is my intention to review my Air Quality Strategy in due course. I welcome your contribution to this valuable debate. I welcome your support for the LEZ. I am confident of the important impact that this scheme will have on London’s air quality. You raise a number of issues on this initiative. The LEZ focuses on heavier vehicles because they are the most polluting per vehicle. The new emissions influenced congestion charge I have proposed (a £25 a day charge for Band G vehicles in the Central London Congestion Charge Zone) will address emissions from the worst polluting cars. Proposals for this new initiative will be consulted on later this year. It has not been possible to include NOx abatement measures in the LEZ, as there is no accreditation system for these technologies, and therefore no way of guaranteeing effective emissions reduction. I have been lobbying the UK Government on this issue. I have no control over taxation policy but have been lobbying the UK Government to implement effective fiscal incentives and penalties to help reduce transport emissions which contribute to air pollution and climate change. Improving air quality is a major part of my overall commitment to improving London’s Environment and I welcome your support on these issues.